We are so happy that you have joined this gathering. Our intent is to be a nurturing place of creativity and inspiration. 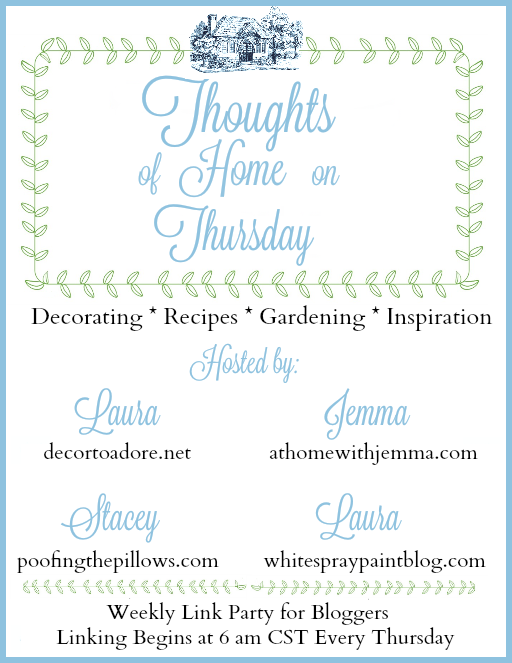 Each week we hope that you will share your decorating ideas, recipes, thoughts on gardening or simply what inspires you. Your link will be featured on all four of our blogs. To celebrate we are hosting a giveaway each week for a month. Anyone who links will be eligible to win. Linking more than one post means you are eligible for multiple entries. This week the giveaway is being hosted by Laura of Decor to Adore. 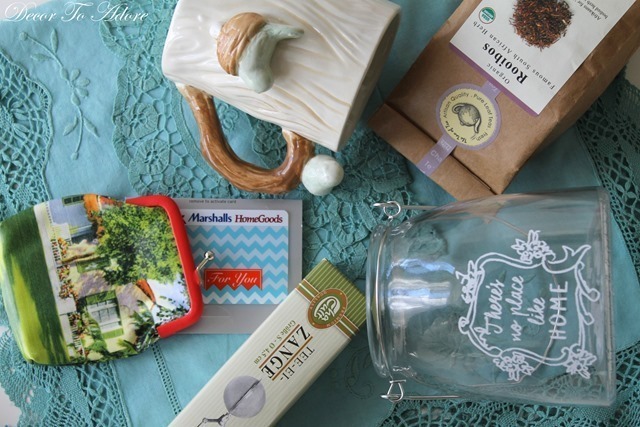 The giveaway includes a one of a kind flea market apron, mug, loose leaf tea, strainer, decorative accent piece, and a $20 gift card to HomeGoods/TJMaxx/Marshalls tucked into a darling coin purse. *Since this is our inaugural post we have selected a post from each of our four blogs. In the future, weekly selections will highlight four guests who link up the previous week. 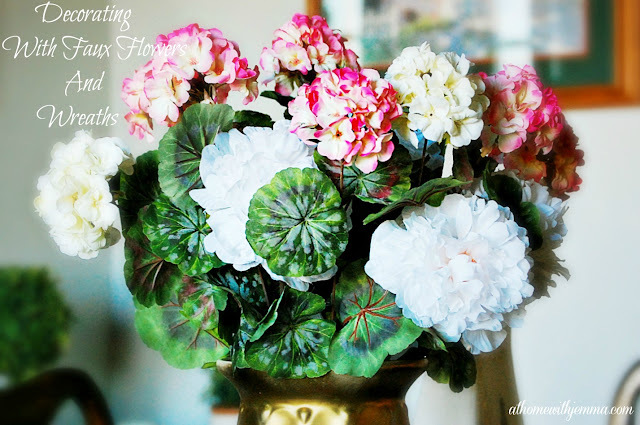 At Home with Jemma shares How to Decorate With Faux Flowers & Wreaths. Decor to Adore - Raspberry Orange Trifle. 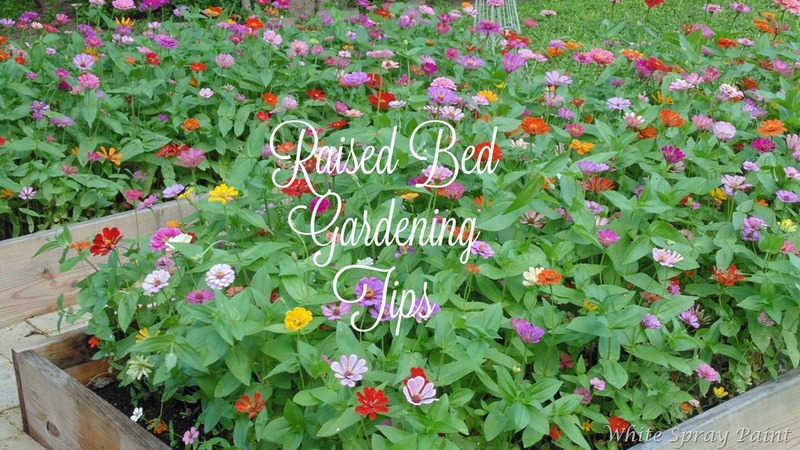 White Spray Paint offers fantastic Raised Bed Gardening Tips. 1. A link back to this post or any of the four hosts websites would be greatly appreciated as it will help new friends to find us. 2. Please share up to 3 of your favorite posts. Please link to a specific post. Kindly remember not to link advertising or shops. 3. In the spirit of camaraderie we encourage you to visit one another. Hi there! I just linked up, but it's not showing up on any of your blogs. Maybe there's a problem with the link system or something. Just wanted to let you know. :) Anyway, thanks for hosting! Congrats on the new party, ladies! Thanks for inviting me and I'll put it on the calendar right now! Pleased to meet you !! I am now following you wherever i can and i just linked up to your new and exciting party!! I will be back each week and I want to say Thank You so much for hosting a party that reminds those of us that have been blogging for many years of what blogging used to be like!! Hi Stacey, love this new link up!! Great giveaway too. Thank you for hosting and all that goes into this format. I am ready to link up when the linky appears. Congratulations on your new party! Thanks for the giveaway too!! Stopping by to say Hi and how much fun this is. I am sitting here with my coffee and chocolate chip cookie, it is just as if we were all together in one big cozy room! A party!! How fun! 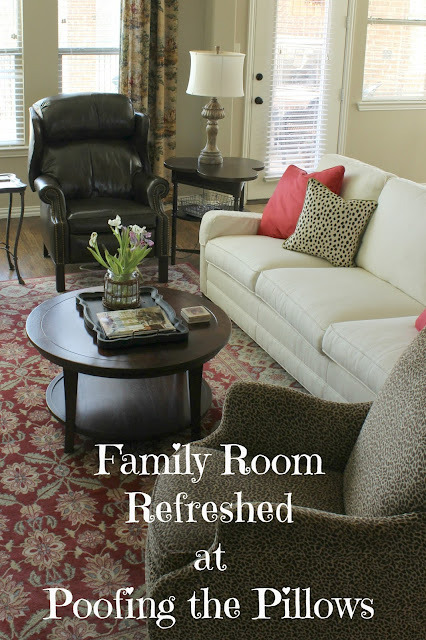 Thank you for a pretty place to gather and peek, Stacey! Off to visit! It looks like the party is off to a great start. Thanks to all the ladies for hosting and appreciate the giveaway. Thank you for helping plan and execute such a lovely party! Given the response, quite a successful endeavor indeed! It will be nice to reconnect with familiar friends and meet new! This looks like such a fun linky party. I have already found some kindred spirits that are new to me :) Looking forward to more! Hi Stacey! So happy to have a new party to link up to! It looks like it will be a fun place to browse! Thank you ladies for hosting. Looking forward to reading all the wonderful blogs that link up for the party! What a fabulous turn out! Congrats to all of you!! What a great turn-out! So exciting for you gals and no wonder because this is such a nice place to be! I'm so glad so many are joining in! Thanks to each of you for all your efforts! Thanks for the invitation to join the party! You had quite a good start! Stacey, Just thought I'd stop by and say hi. I've been over here before and it 's nice to connect the blog with the face. So fun meeting you yesterday. Just browsing the links and thinking your first week is off to a great start. Stacey - Thanks for creating a new linky party! Looking forward to visiting each week! Super idea for a link party. Please allow me to recover a big more from the flu and I promise I'll participate. I don't have any thing new posted recently other than book posts. Wow, check out your participation! This is awesome. Thank you for hosting a neat party, Stacey! What fun!!! This is awesome party. Great fun! thanks for hosting. Fun party! this is just amazing. Thank you for hosting a neat party, Stacey!